I wanted to note a particular artist at the Moscow Renaissance Faire. 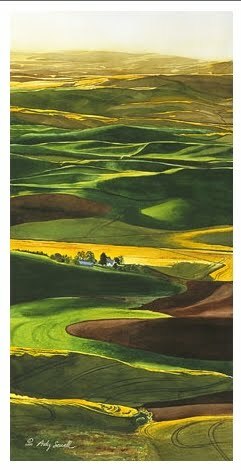 His name is Andy Sewell and I first saw his artwork (specializing in paintings of the Palouse region) shortly after we moved to Idaho nearly eight years ago. This fellow and his wife work hard to market his artwork. We see his booth set up at many regional events, and he's one of those noteworthy artists who isn't a parasite on society by taking government money to pursue his muse. I know this for a fact because I spoke to him in a brief phone interview last year as the basis for a WorldNetDaily column on the subject. Here's the small print I bought last year. He has so many beautiful landscapes that it's hard to choose only one. This is understandably one of his best-known paintings. It staggers the mind how much talent people can possess. You might visit his website and see what other glories are on canvas. Wow, he certainly is talented! Thanks for posting this, I'm on my way to his site right now. I've known Andy for 20+ years. I knew him back when he was in kid in Architecture classes at the University of Idaho. I knew him when he got married and had kids. And I knew him when he realized that he *had* to pursue his dream and true calling as an artist. 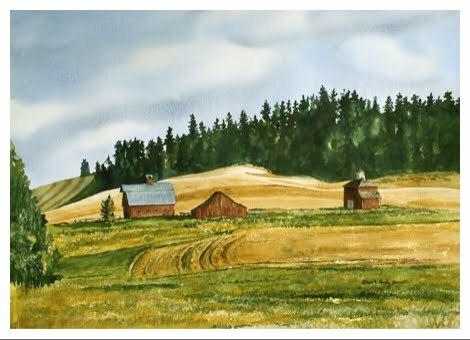 I've seen him develop his art over the years and his talent never ceases to amaze me. And, as you mentioned, he is as true and real of a person as he is an artist. 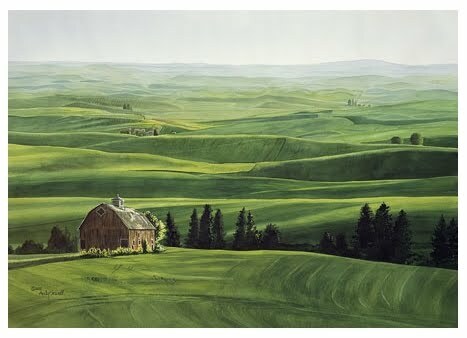 Once you see his paintings, you will fall in love with the Palouse and his interpretations of it. Once you meet him, you will be entertained and impressed with his infectious zeal for his craft, his family and life! A real gift to the Palouse and the art world as a whole, make an effort to get to know Andy and his work. Check out his Web Site, you'll be glad you did!